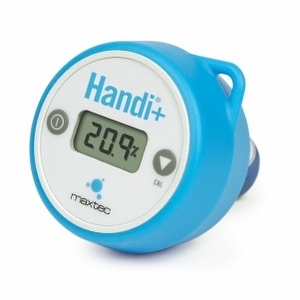 Maxtec has improved the Handi O2 Analyzer to better meet your needs for oxygen analysis. The Handi O2 Analyzer is simple to use, has a one-touch calibration button, new overmold and calibration reminder along with the traditional 2 year warranty. This analyzer is great for spot-checking O2 percentage in hospitals, clinics and in homecare environments. Resolution/Display: 0.1% - The three digit LCD indicates values between 0.0 - 99.9% oxygen. Over range indicated by one decimal point on display located after the first digit. Linearity/Accuracy: @ 15° to 40°C. ± 1 % of full scale at constant temperature, R.H. and pressure when calibrated at full scale ± 3% actual oxygen level over full operating temperature. Power: Powered by one internal, non-replaceable, Lithium battery, CR2450. Power on push button automatically shuts off after 80 seconds time-out. Electronics rated general purpose; not for use in hazardous areas or for use with flammable gases. Sample Port: M-16 x 1 thread with diverter fitting and barbed tubing adapter. Diverter Fitting: Fits medical standard 15mm “T” adapter. Expected Storage Life: Two months. Special freshness seal on sensor. Operating Pressure: Atmospheric pressure to 3psig. Environmental: General purpose housing equivalent to NEMA 1. The Handi+ is not waterproof. 0 - 95% RH, non-condensing.